Five miles up stream from the point where the Cornwall Canal joined the St. Lawrence River there was another small rapid at Farran’s Point. 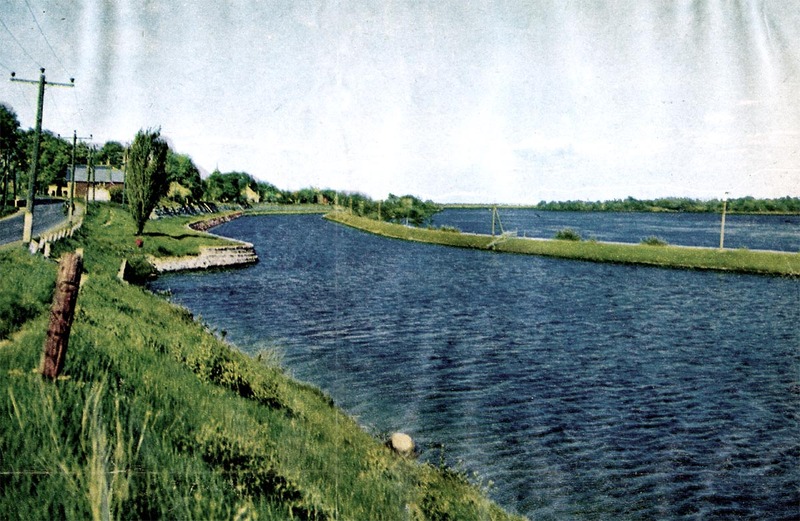 The construction of the Farran’s Point canal began in 1844 and was opened in June of 1847. Down bound ships always sailed down through the rapid very close to the canal bank. 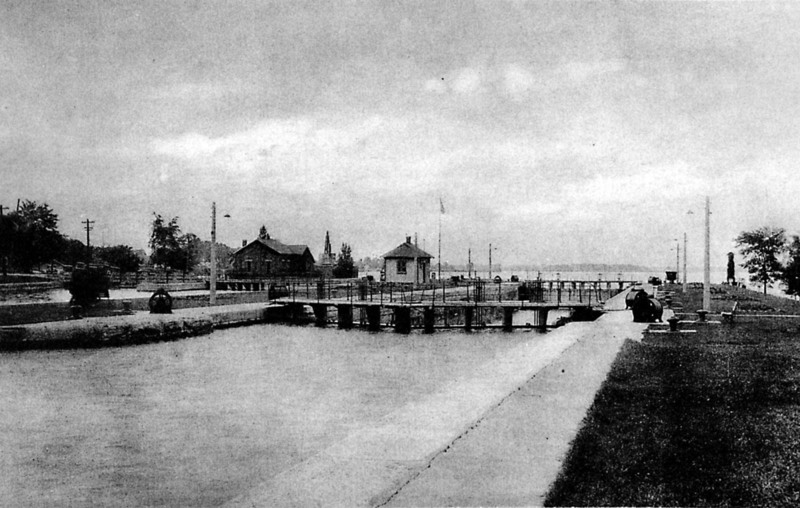 The new larger lock, an 800 foot long “fleet lock” was built over several years, 1899 to 1903. 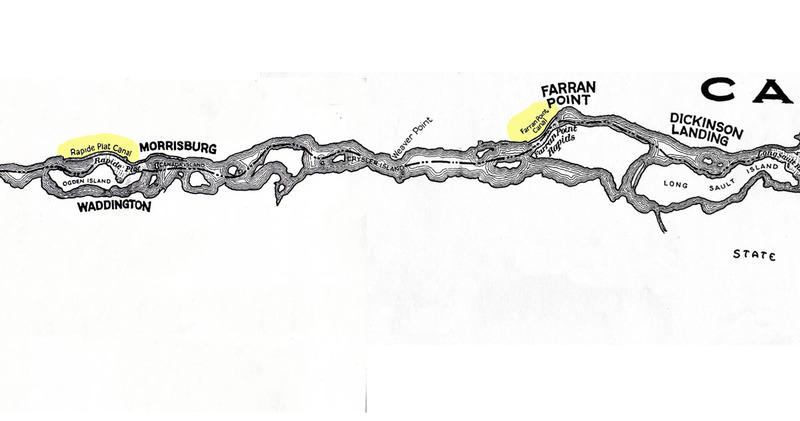 The next canal of the Williamsburg series began 9 1/2 miles further up the river at Morrisburg. 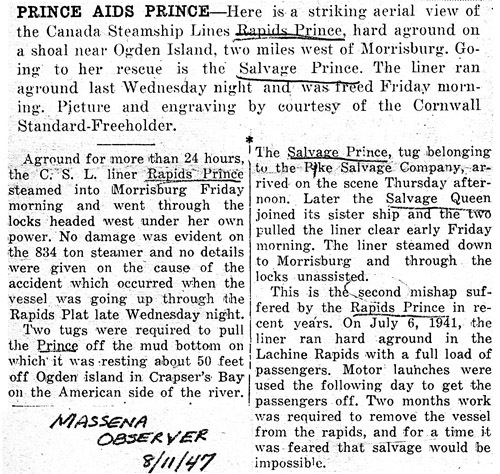 Above Morrisburg there existed another set of rapids known as the Rapide Plat. This rapid was spread out over a stretch of the river almost four miles long and descended 11 ½ feet. The first canal was built between 1844 and 1847, being opened in September of that year. These locks were 200 feet in length, 45 feet wide with 9 feet of water over the sills. 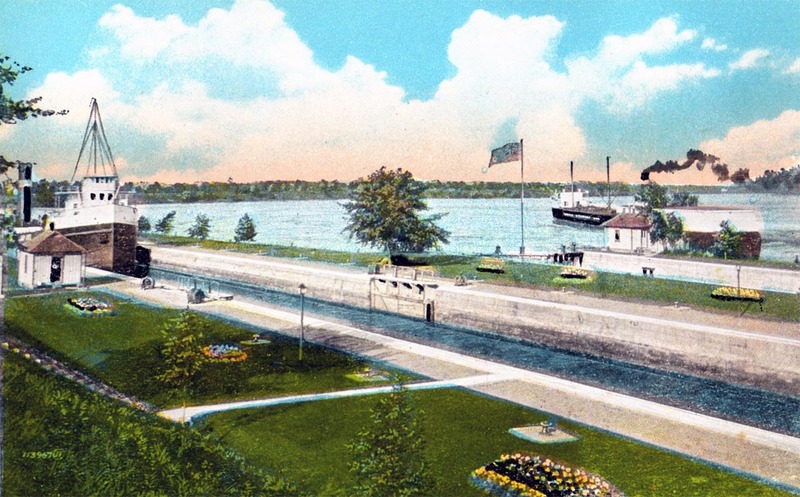 It was rebuilt between 1884 and 1904 with a new lock built at Morrisburg beside the original that was 70 feet longer and allowed ships to pass loaded to fourteen feet. SHWC001: Map of St. Lawrence River from Ogden Island to Dickinson Landing. This map shows the old pre-Seaway St. Lawrence River with the rapids, canals and islands that existed. Looking upstream toward the lock opening into the river. 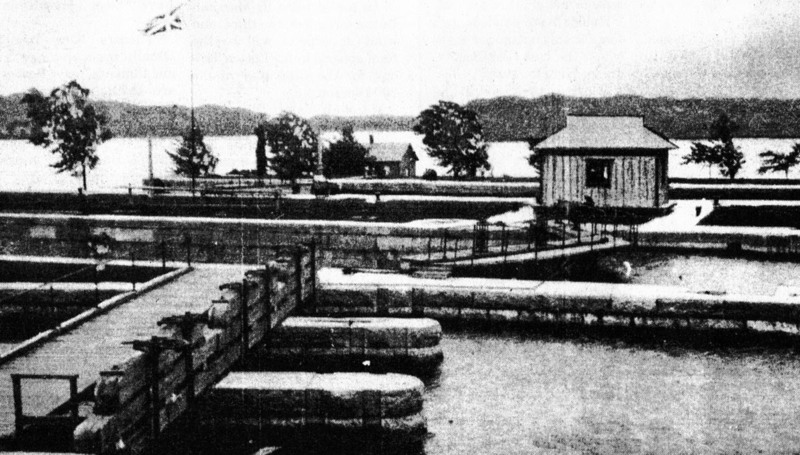 From left to right are the 800 foot long “Fleet Lock”, the original 200 foot lock, a pair of spare wooden gates stored in the water above the locks, and the rapids where the down bound ships would sail. This view shows how the lock area grounds were kept by the men who worked there. 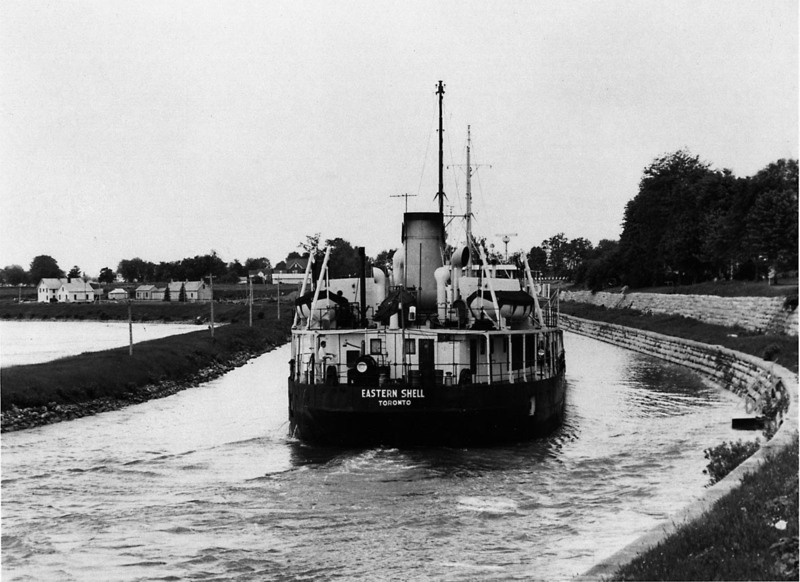 A down bound canaller is seen beyond the canal running down the rapids. SHWC004: Looking down the Farran’s Point Canal. 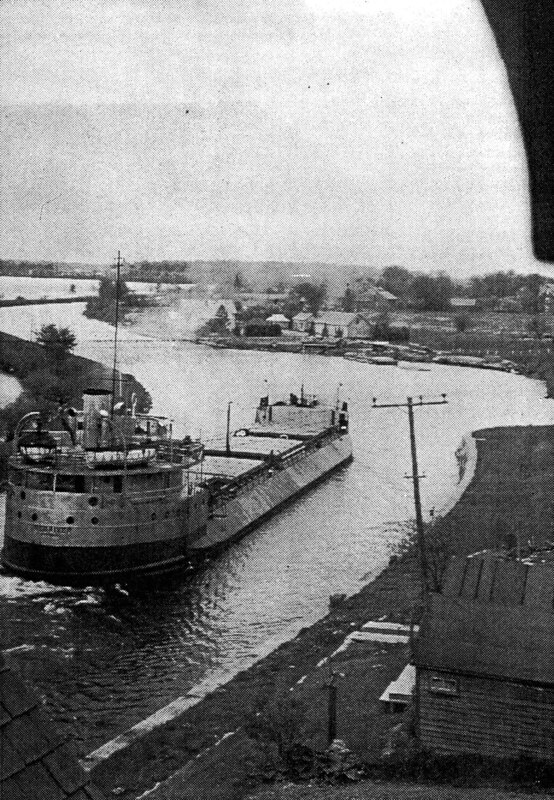 The Misener canaller FRANK H BROWN is up bound out of Lock 22 while the Upper Lakes & St. Lawrence Transportation canaller SHELTON WEED runs down river in the rapids. Gord Macaulay, who took this photo, said he never saw a canaller go so fast in his life! SHWC005: The last day for Farran’s Point Lock. This picture was taken on June 29th 1958. It shows the Motor Vessel TECUMSEH upbound with ore from Contrecoeur for Buffalo in Lock 22. She was one of the last ships through the canal. This aerial photo was taken at a point about 4.5 miles above the head of the Farrans Point Canal. The Keystone Transports Ltd. canaller, KEYWEST, is passing downstream between Bradford Point, N.Y. (foreground) and Cook's Point, Ont. She is just abreast of the Prunner Shoal Lighted Buoy (54 U). The foreign vessel upbound to the left, HELGA SMITH, is heading off to the north of Crysler Island. The field directly above the smokestack of the HELGA SMITH is the exact location where the Battle of Crysler's Farm took place on November 11, 1813. Close to where the dark 'S' shaped creek can be seen is where the British forces charged and took possession of an American artillery piece. The British Regulars and Canadian Militia formed their lines to the left of this photo and the Americans were lined up just to the left of the creek to begin their attack. 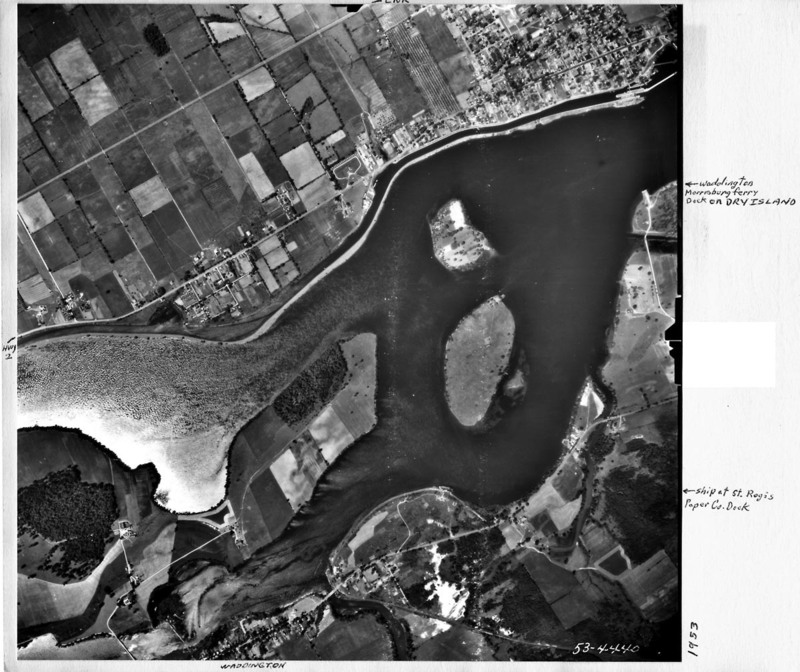 SHWC007: Aerial view of St. Lawrence River below Morrisburg 1953. The island to the right is Gooseneck. It is now completely submerged and named Gooseneck Island Shoals. Similarly the next two islands to the left are now shoals around which ships must navigate. Doran Point is above to the left on the north shore of the river. This is now Broder Island. It is three quarters of a mile below the entrance to the next canal at Morrisburg. SHWC008a: Aerial view of St. Lawrence River from Morrisburg to west of Mariatown. 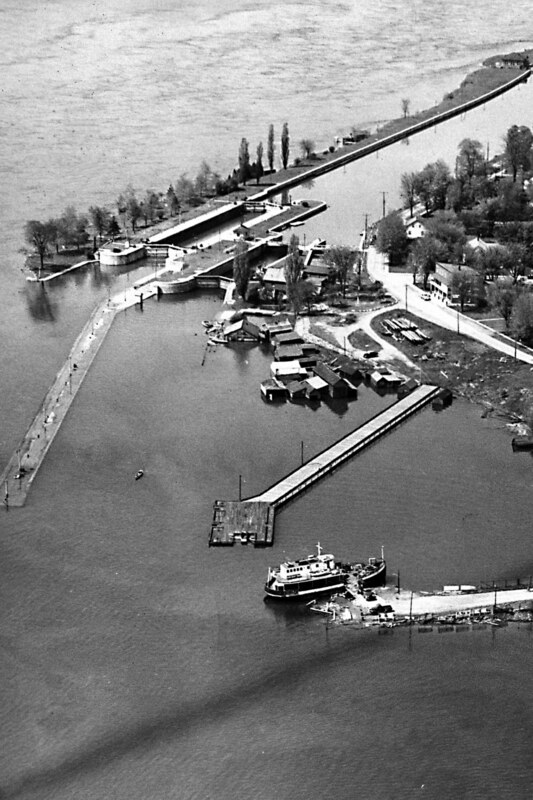 The entrance to the Rapide Plat or Morrisburg Canal can be seen at the top right hand corner. 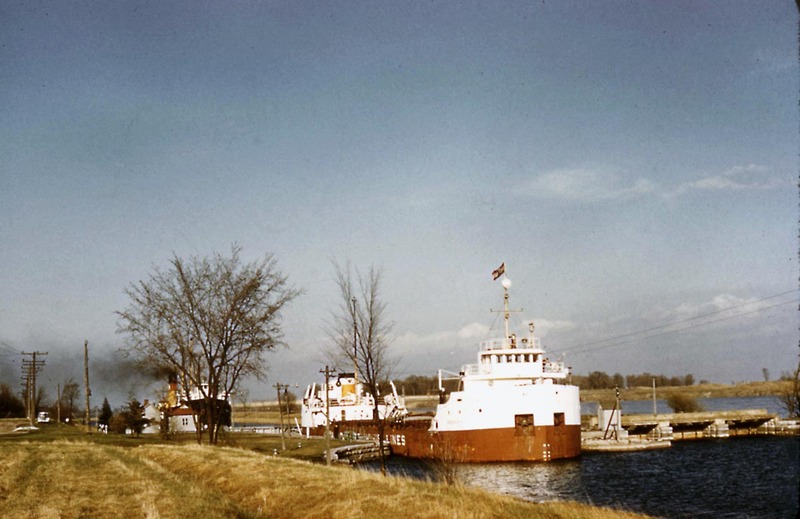 The Morrisburg Ferry dock is due south of Lock 23 and is located on Dry Island. 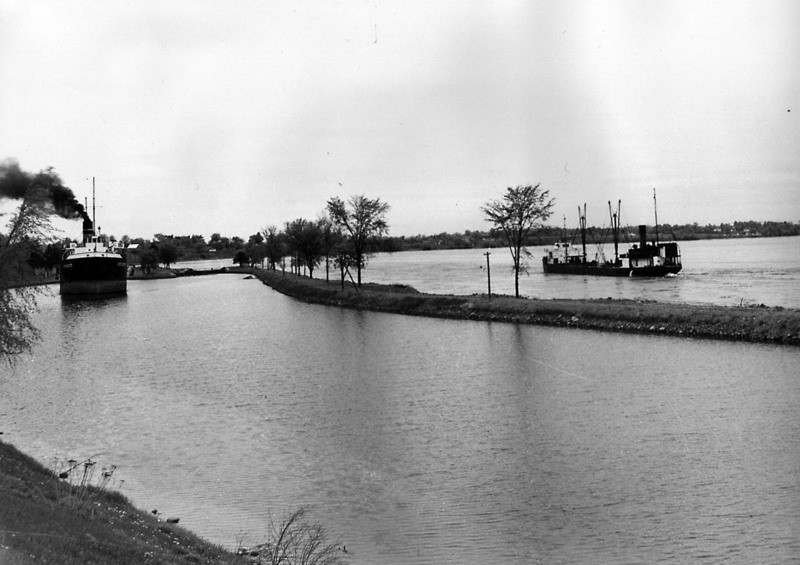 To the lower left is a bridge across “The Little River” which is in reality a shallow part of the St. Lawrence which ran south of Ogden Island. Farms, now gone, can be seen on Ogden Island. The two islands to the right of center are Canada to the north and Clark to the south. The main Seaway shipping channel now runs between Ogden and Canada Islands. Clark Island has disappeared beneath the waters. 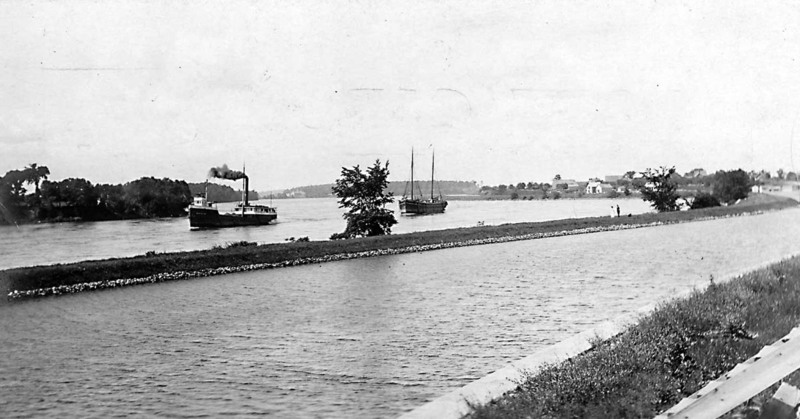 SHWC009: Morrisburg Harbour and Canal. 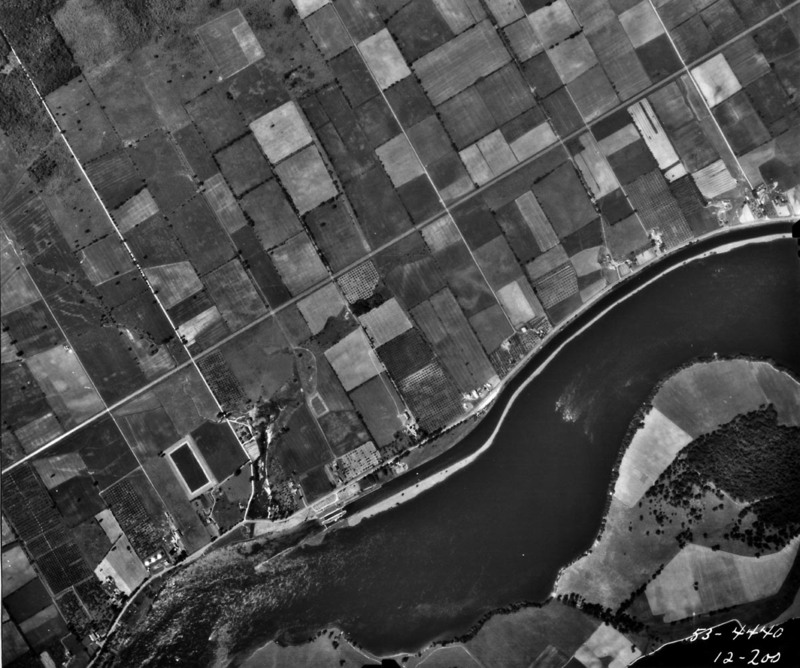 From left to right in this aerial view we see the entrance to the Rapide Plat canal with the first lock that was completed and opened in September 1847. The channel immediately to the right of the lock is to supply water to the hydro electric plant. 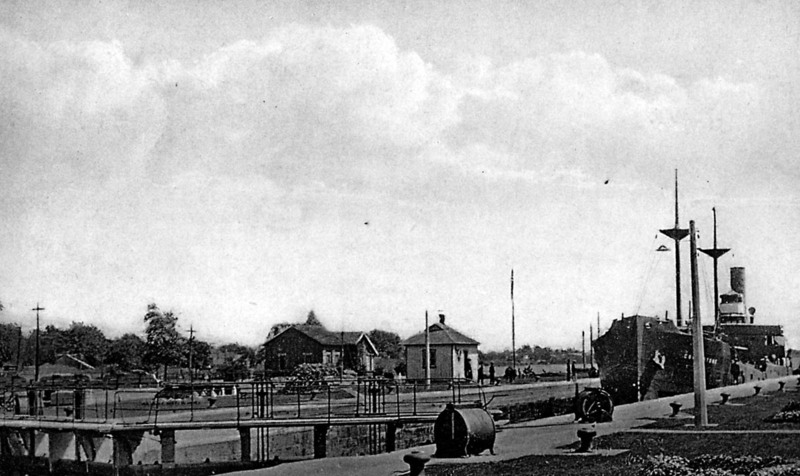 The long pier in the foreground is the approach to the larger lock completed in 1904. Next down the shore is the Municipal Wharf where a gate lifter is secured. To the left of this wharf is the landing for the Morrisburg ferry to Waddington N.Y. 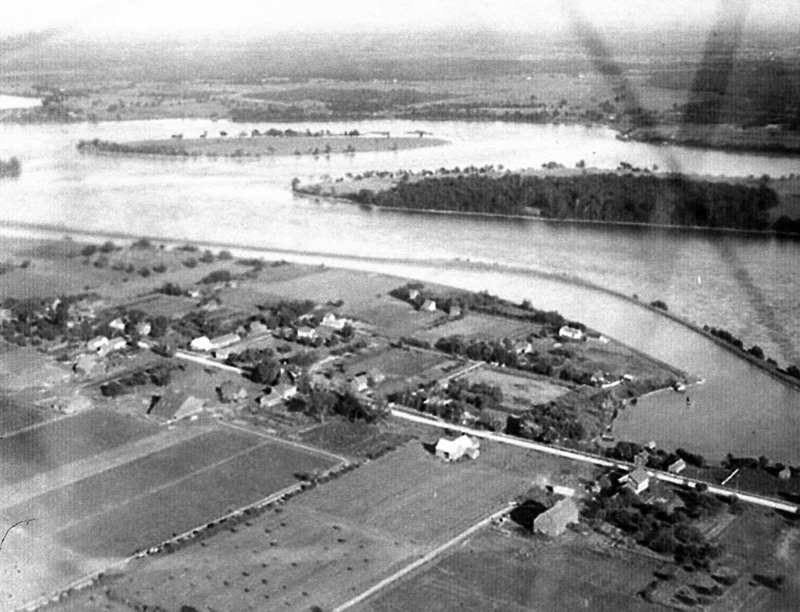 The area of the village of Morrisburg seen here was totally obliterated because of the advent of the Seaway. SHWC010: Looking west over the harbour at Morrisburg. 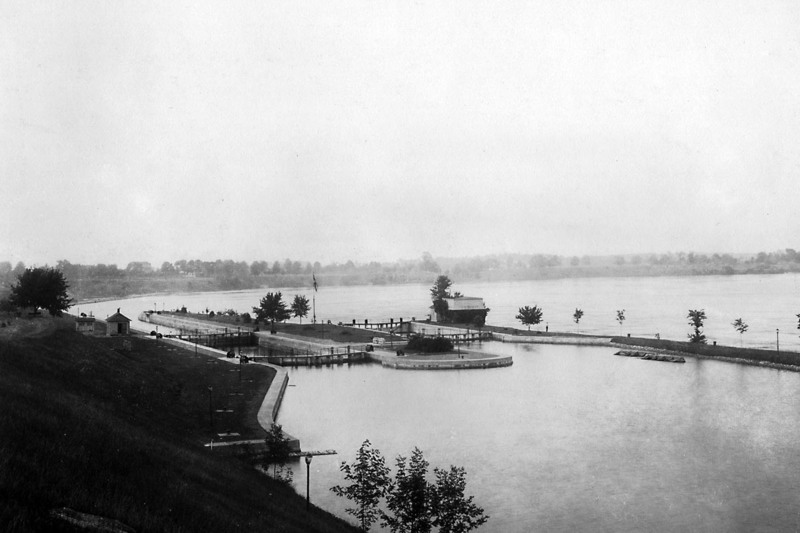 From left to right, the approach wall and Lock 23 completed in 1904, the old Lock 23, the power canal for the hydro electric plant hidden by trees, the municipal wharf, the motorvessel/ferry MORRISBURG at her dock unloading vehicles. 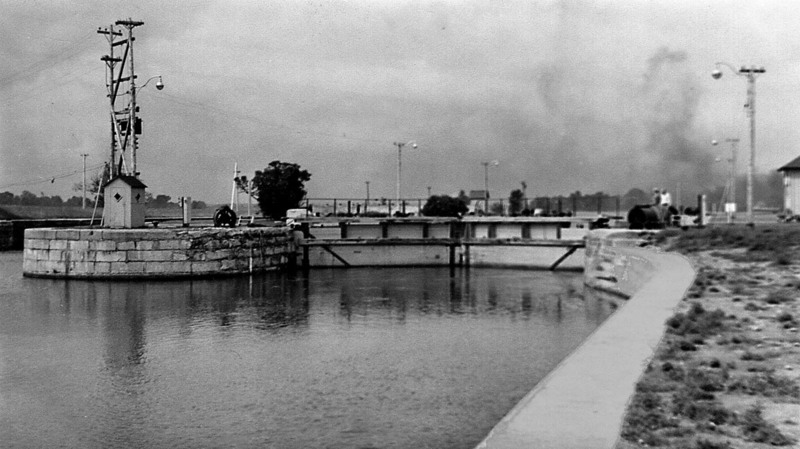 This photo shows the lower gates of the Morrisburg Locks as seen from a steamer passing down the river in July 1939. SHWC012: Two salties waiting below Lock 23. The MANCHESTER PIONEER from England, left, and COLONIA from Germany wait on the approach wall below Lock 23. Out in the river a canaller is running down the rapids. SHWC013: ORIS waiting below Lock 23. 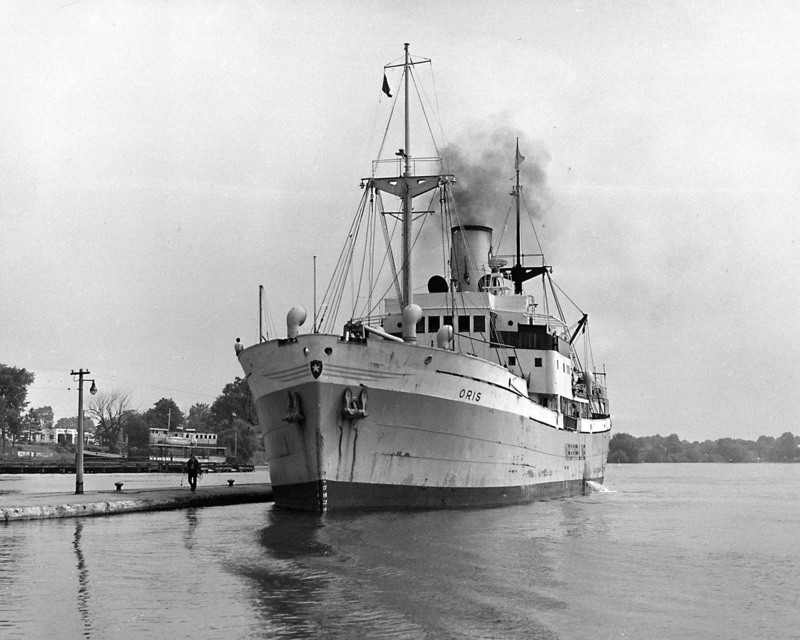 The Norwegian flag salty ORIS made several trips into the Great Lakes from 1949 to 1955. Behind her to the left is the ferry MORRISBURG. 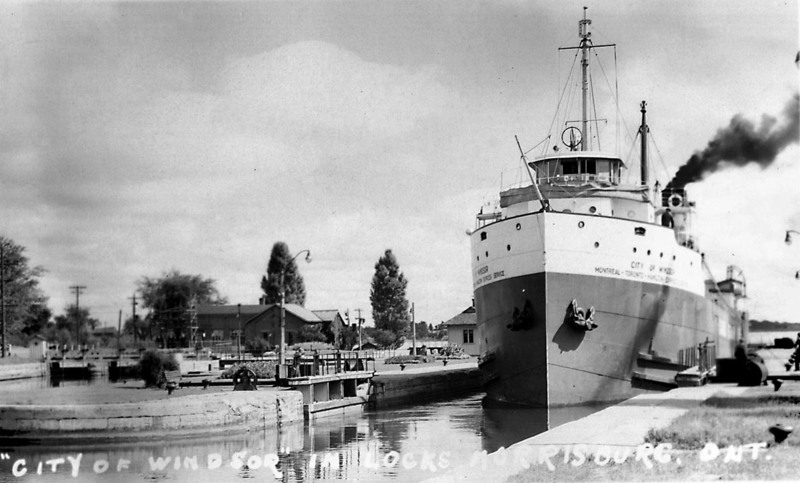 SHWC014: Wooden ships on the pier below Morrisburg’s Lock 23. 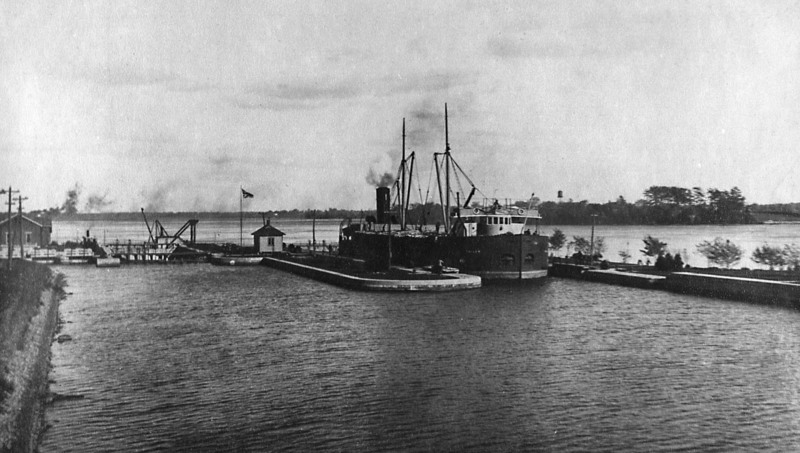 This view below Lock 23 at Morrisburg shows the tug Fredmac and two barges upbound and the steamer Mapleglen downbound. SHWC015: The last ship through Lock 23. 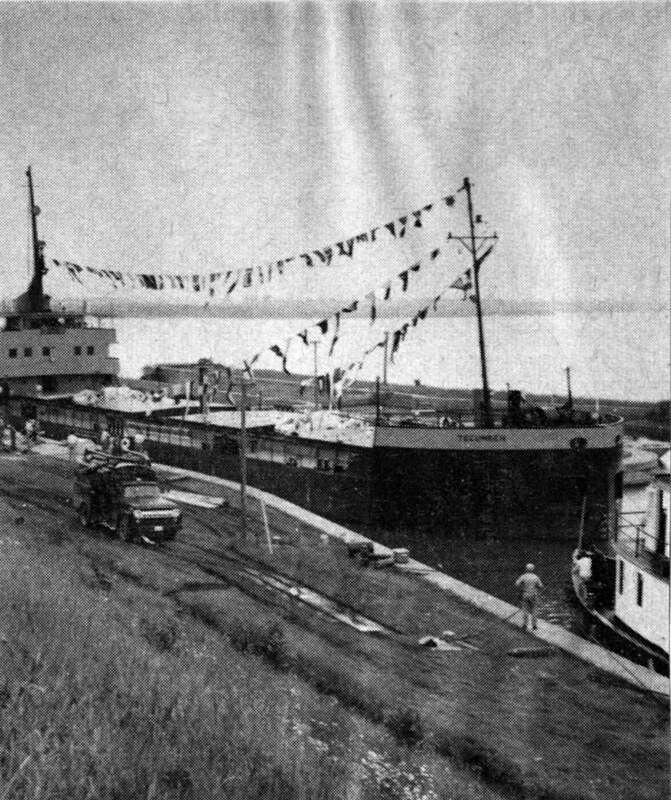 On June 29, 1958, the Becansfield motorvessel TECUMSEH up bound into Lock 23, the last merchant vessel to do so. The old canals closed for good this day and the flooding soon began. The view is through the entrance to the first lock built at Morrisburg in the 1840’s. 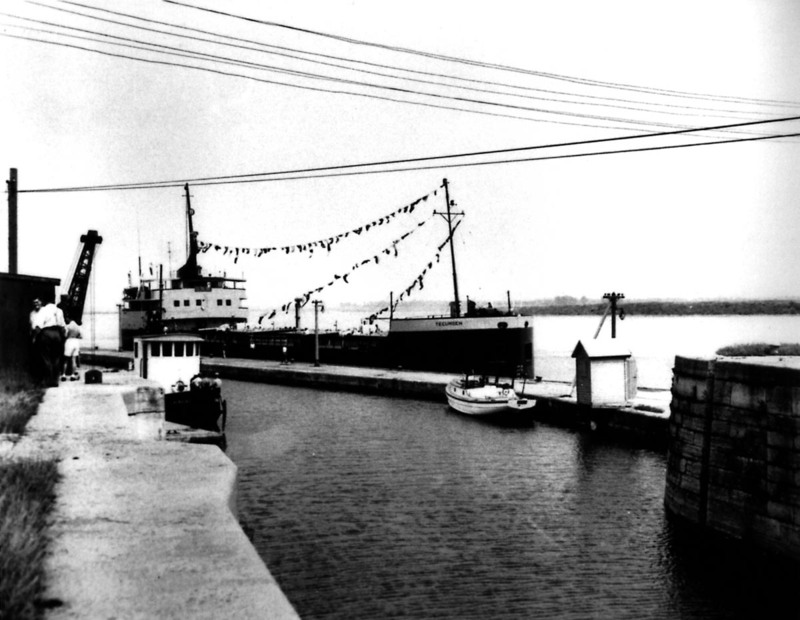 Morrisburg Locks and park at the foot of Lock Street, prior to the Seaway flooding. SHWC017: Power Canal and Hydro Electric Plant at Morrisburg. April 1955 - Building at left is the Morrisburg Hydro-Electric Co. Its water intake is in the foreground. The water is unusually low. Next to it you can see the railing on the gate of the old original Lock 23, completed in 1847. Beyond that is the Tugboat "W.A. Bowden". Murphy Island is in the background. SHWC017a: Flower Beds at the west end of Lock 23. The men who worked at the lock took great pride in the appearance of their facility. SHWC018: Looking down the canal at the Morrisburg Locks. 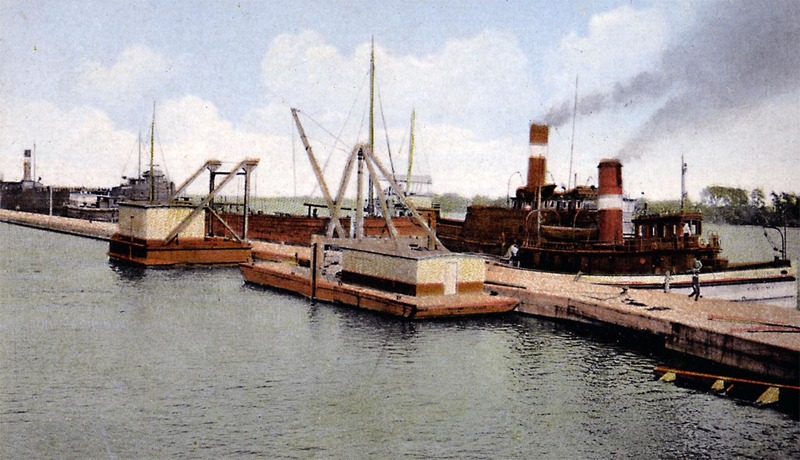 From the left we see the Morrisburg Hydro Electric plant and power canal leading down to it, old Lock 23 with the gatelifter secured below it, new Lock 23 with steamer TOILER, loaded with pulpwood, exiting the lock up bound. Date of photo about 1919. SHWC019: New Lock 23 at Morrisburg. The canaller JAMES STEWART approaching Lock 23 from the river. 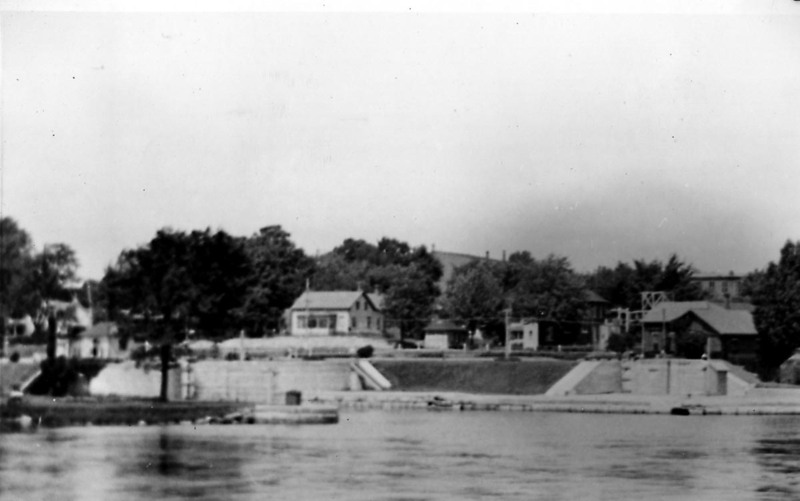 The Morrisburg Hydro-Electric plant is on the left. SHWC020: Looking down through Lock 23. SHWC021: German flag freighters at Lock 23. 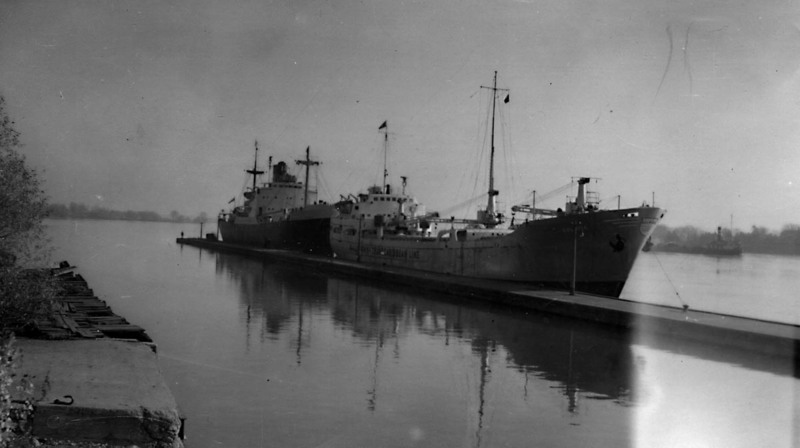 Two ships from Germany; The KORBACH on the left is waiting below the lock and the JOHANNA is down bound into the lock. 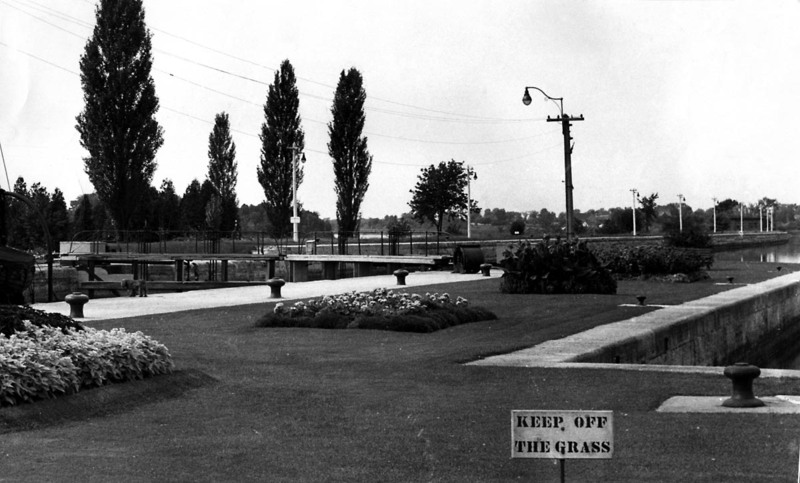 The year is 1958 and in the background can be seen the trees have been cleared off the islands. The government tug W A BOWDEN is secured above old Lock 23. 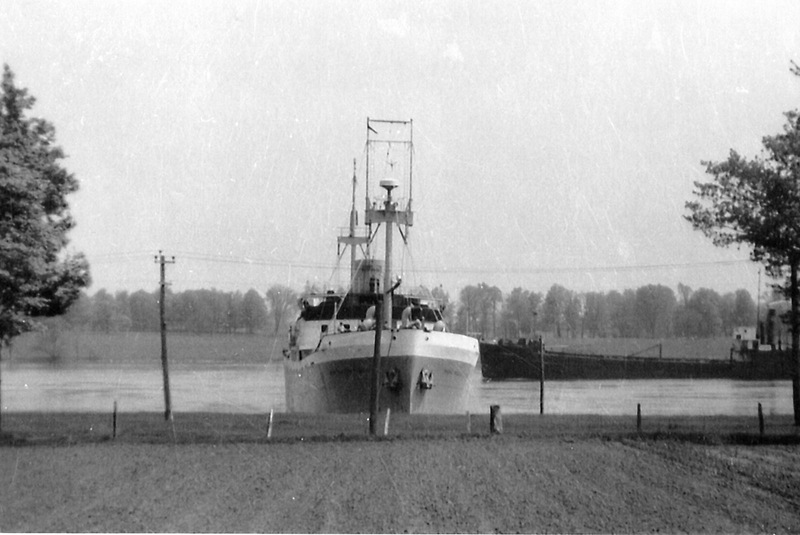 SHWC022: Saltwater ship entering Lock 23. 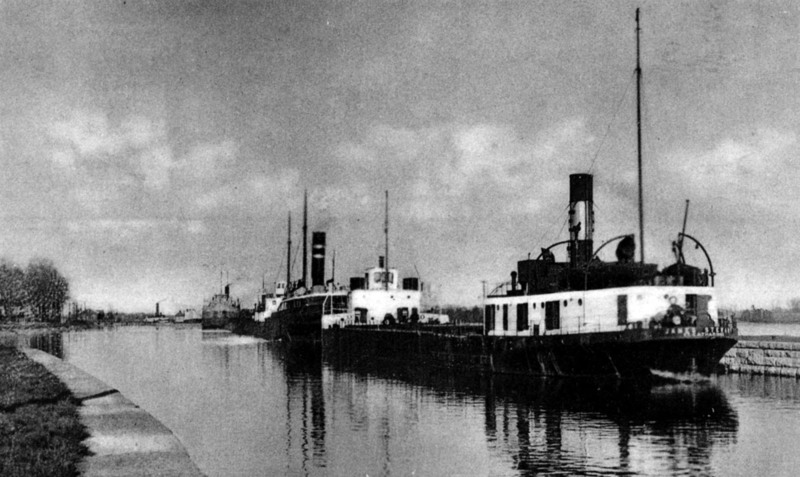 British steamer CORALSTONE upbound in Lock 23. The British flag CORALSTONE sailed into the Great Lakes 1927-’29 and 1933. SHWC023: CITY OF WINDSOR departing Lock 23. The package freighters built for CSL were slightly narrower than most canallers. Therefore they moved more quickly into and out of the locks. They were also given priority over bulk freighters for the turn at getting the lock. SHWC024: Canallers waiting above Lock 23 for their turn to use the lock. This view shows steamers above Lock 23. 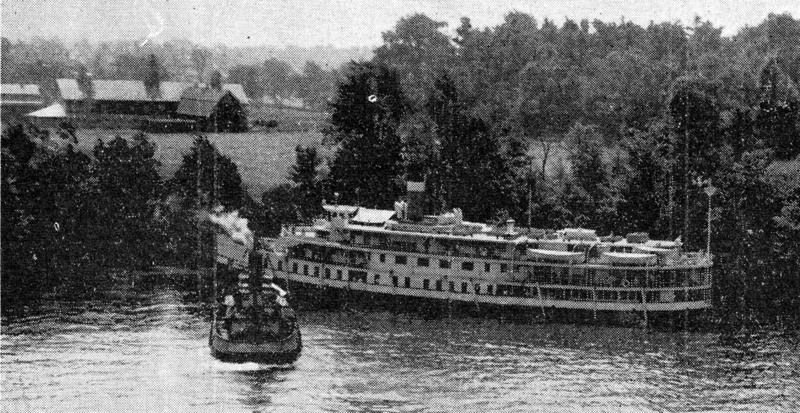 Steamer "James Stewart" is in the foreground. 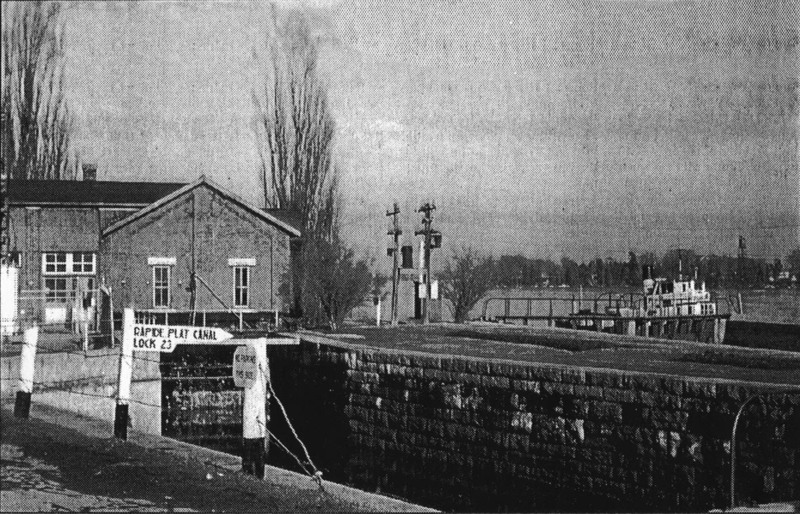 When water levels in the Rapide Plat were too low to risk fully loaded down bound canallers shooting the rapids, they would use the canal to bypass the rapid. The choice of whether or not to shoot the rapids was up to the captain, and he would be checking water level gauges before attempting it. SHWC025: A.E. AMES up bound in the Rapide Plat Canal. The A.E. 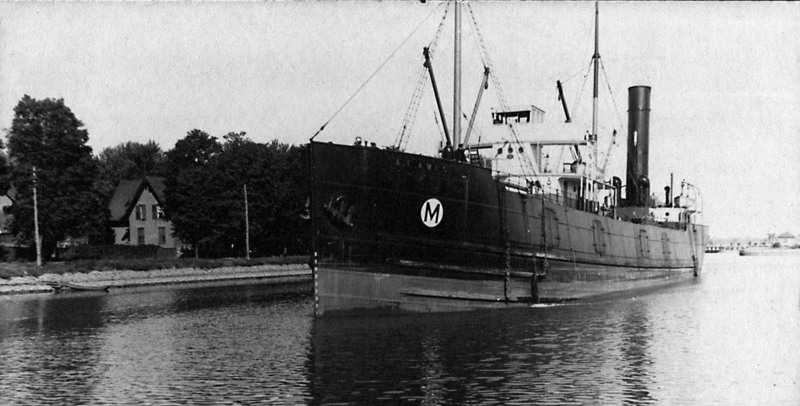 AMES sailed for the Merchants Mutual Line on the Great Lakes before WWI. She served overseas during that war and never returned to the Lakes again. 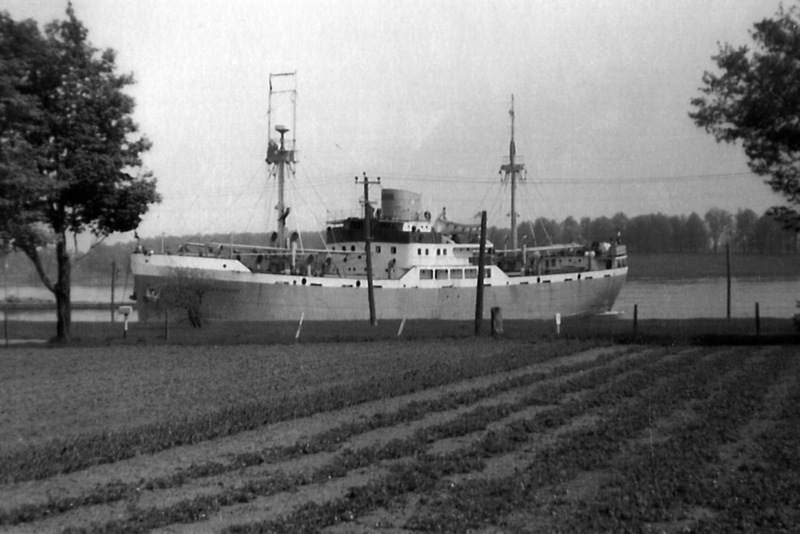 This ship has side ports for the handling of package freight and is typical of the freighters imported from England shortly after the new canal opened. A.E. AMES was a war loss on September 12, 1940. SHWC026: Looking up the Rapide Plat Canal from 81 Lakeshore. 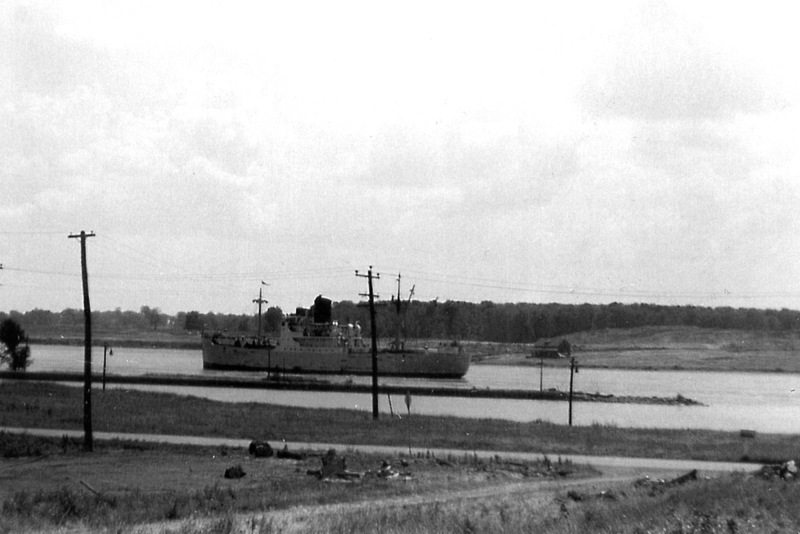 The RED RIVER approaches the old Morrisburg Shipyards as it makes its way west along the Morrisburg Canal in 1955. Photo was taken from the tower window at 81 Lakeshore Dr.
Morrisburg Leader Sept 27, 2000. SHWC027: Rapide Plat Canal West of Morrisburg. RAPIDE PLAT CANAL - Morrisburg, Ont. - Looking down the canal from a point 1 mile above Lock 23. 1954. SHWC028: Tanker EASTERN SHELL heading up the canal. The buildings to the left of the Shell tanker EASTERN SHELL are the Government Shipyard. It was located just west of Steward’s Creek. SHWC029: Ships passing Canada Island. The wooden bulk freighter RALPH T HOLCOMB towing the schooner barge FLORA CARVETH run down the Rapide Plat rapids. Canada Island is to the left and Ogden Island with farm houses in view is in the background. 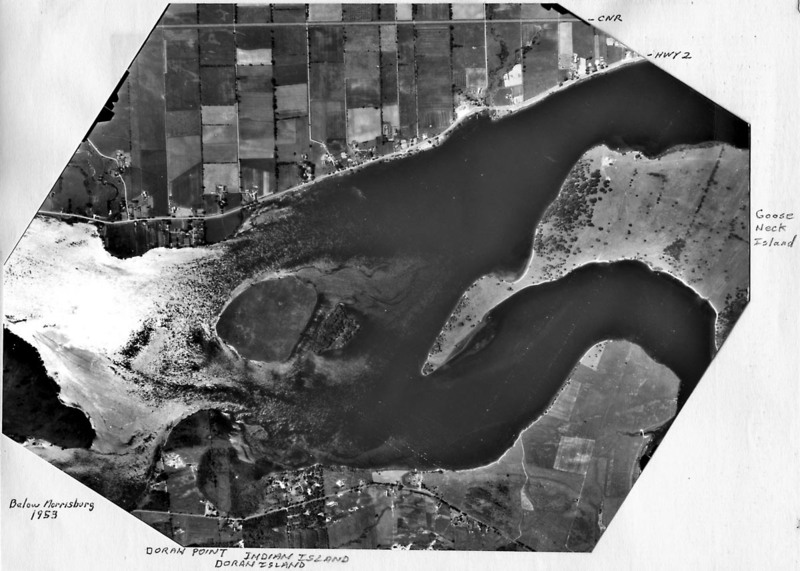 SHWC030: Aerial view of Mariatown 1920. The Rapide Plat Canal runs around the point where Mariatown is located. Ogden Island lies beyond the rapids to the right and Heagles Bay is up stream of the village. SHWC031: Lock 24 at Flagg’s Bay. Lock 24 is also known as the Guard Lock as there was no lift at this lock. If the gates of Lock 23 were carried away by a ship then this lock and weir would be shut down to stem the flow of water down the canal. The down bound ships would run the rapids if there was enough water to do so safely. They would run close by the canal bank to avoid the shallows in the middle of the river. SHWC031a: Tug SALVAGE PRINCE approaching RAPIDS PRINCE ashore on Ogden Island. The farm buildings located on Ogden Island can be seen in the background. SHWC032: Looking up the canal at the gates of Lock 24. This guard lock is bypassed by a weir located on the south side. Therefore no lift. 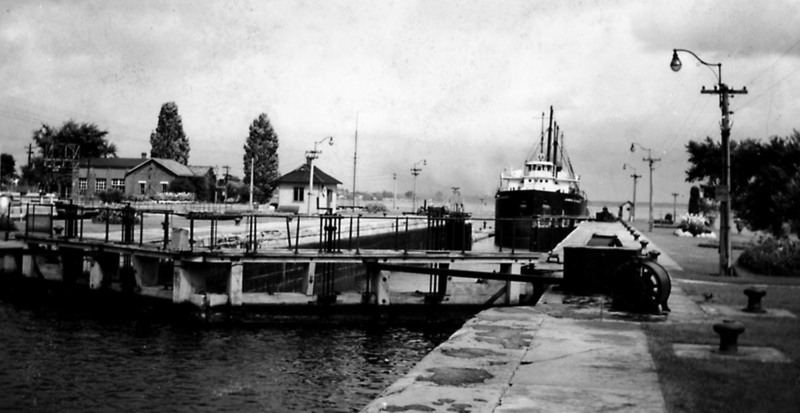 This lock was also known as the Flagg Bay lock as ships would cross it as they sailed to and from the head of the Rapide Plat Canal. SHWC033: M/V IROQUOIS exiting Lock 24. The CSL diesel canaller IROQUOIS departing the Flagg Bay Lock. A Quebec & Ontario canaller waits below the lock for her turn to pass up bound. To the right is the weir which allowed water to flow freely into the canal. When a ship left Lock 28 above Cardinal down bound it could possibly run all the way down to Dickinson's Landing, which was the head of the Cornwall Canal. 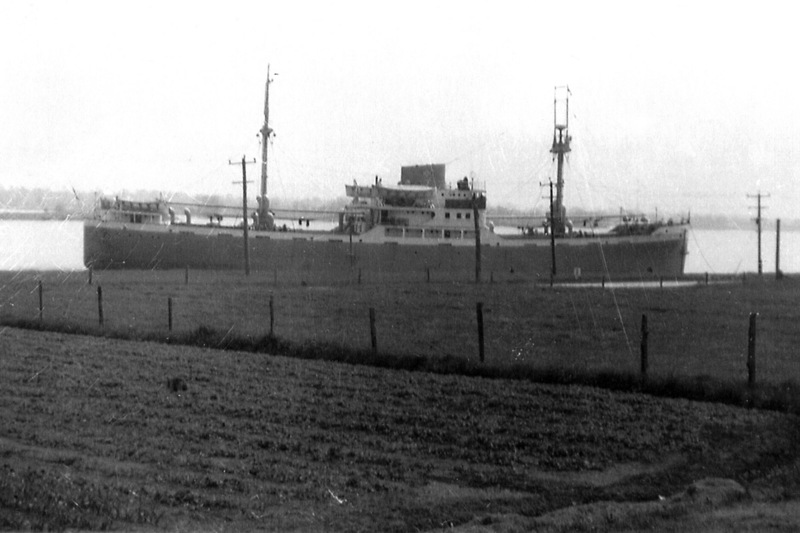 However, during periods of low water, the shallow Rapide Plat was too risky for a fully laden ship. In that case the ships would have to enter Flagg Bay below Robertson's Point in order to make the approach to Lock 24. The MANCHESTER PIONEER is seen passing the tip of the south bank above Lock 24. Flagg Bay is to the right. In the background is Ogden Island. The ship is about to run down the Rapide Plat because she has enough water or not loaded too deep for the passage. The Dutch ship PRINS FREDERIK HENDRIK has landed on the bank at Flagg Bay. She has already landed her crew on shore by means of a landing boom located right at the break of the fo'c's'le deck. A line is seen going ashore from the bow. She is heading up stream but this is the first stage of a successful approach to Lock 24 down bound. To reach here she would turn to port towards the river bank as she was passing Robertson's Point, then go ahead and enter the eddy below the point and allow the stern to sag down river. Then the captain would slowly approach the shore until the starboard bow touched the bank. PRINS FREDERIK HENDRIK winds around to bring her stern up stream. The line ashore is there to hold the bow in position until the turn is complete. The tanker TRANSLAKE is in the stream heading down the Rapide Plat. She is not loaded to deep which will allow her to "go over the Jump." The Jump was a large rock or shoal in the Rapide Plat. PRINS FREDERIK HENDRIK is now in a position where she can reverse engines and pull her bow off the bank and let go the bow line. Then she would go slow ahead and down into lock 24. The crew that landed ashore off the bow will walk down to the lock to rejoin the ship. In the background to the left can be seen the canal bank above Lock 24. SHWC034: Canallers passing Pine Tree Point. 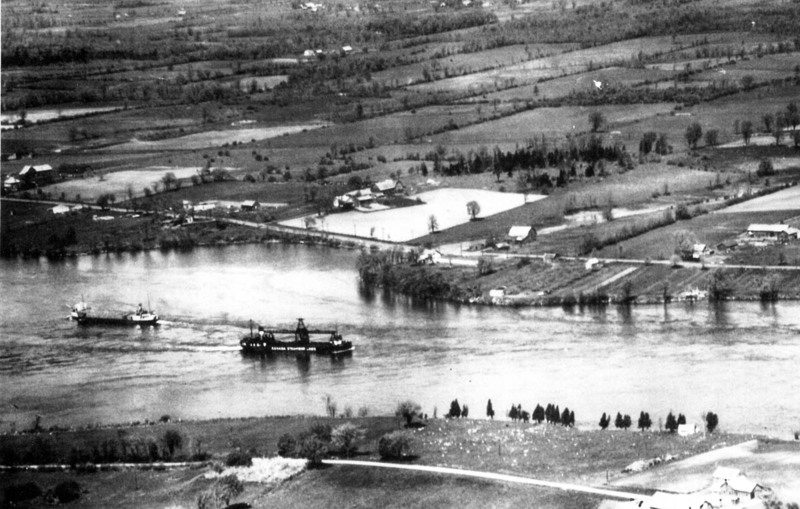 The COLLIER is down bound in the river about mid way between Iroquois and the head of the Rapide Plat canal. The current here is 5 knots. 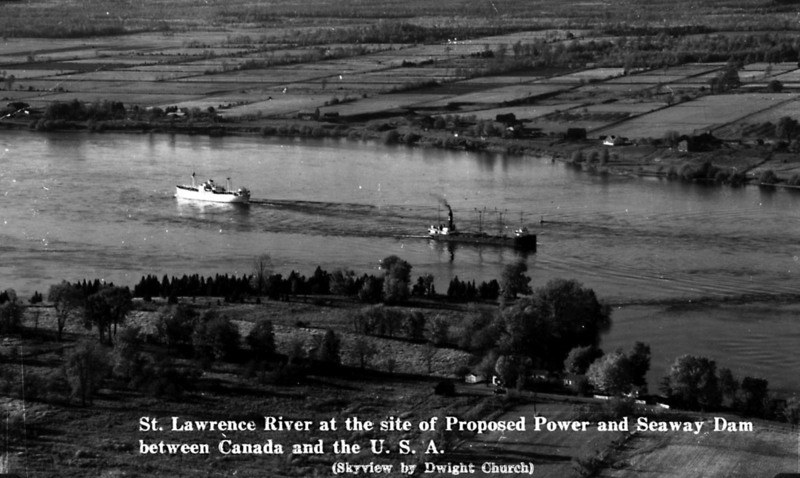 The land in the foreground was mostly removed during the construction of the Seaway in order to widen the river and slow the current.